27 trailers for multiple unit trains in 1930-31 (series 5700, fromthe '50s series 5650). 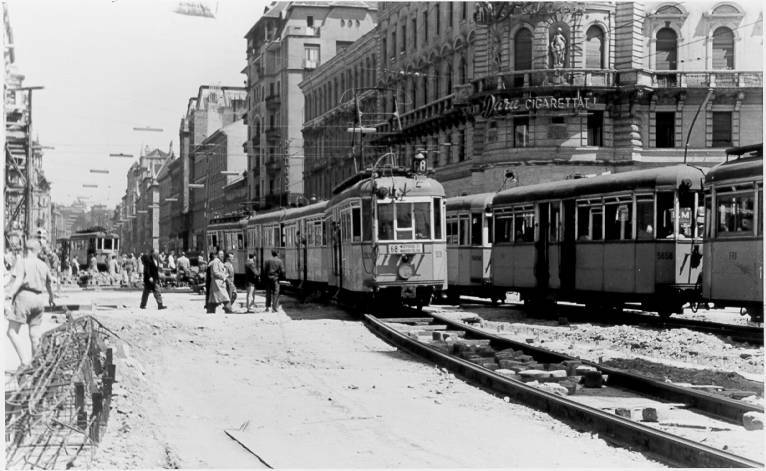 These were the first fully steel-bodied tramcars in Budapest. 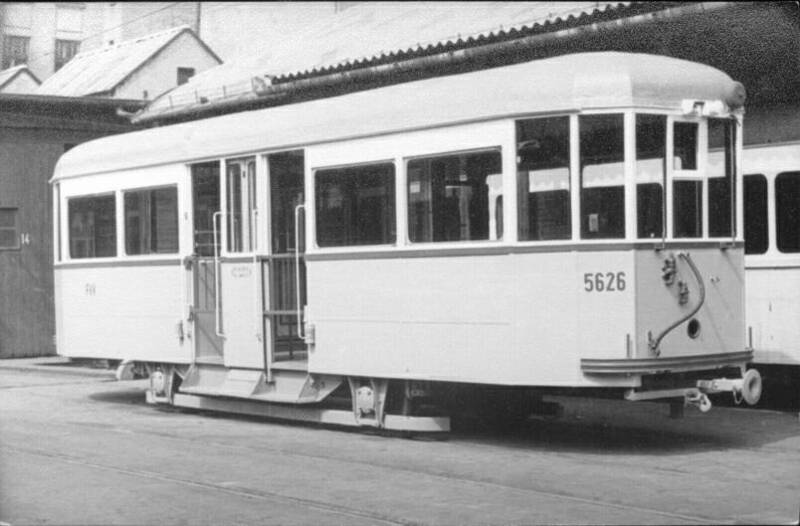 #3204, the introduction of one of the first twin cars. 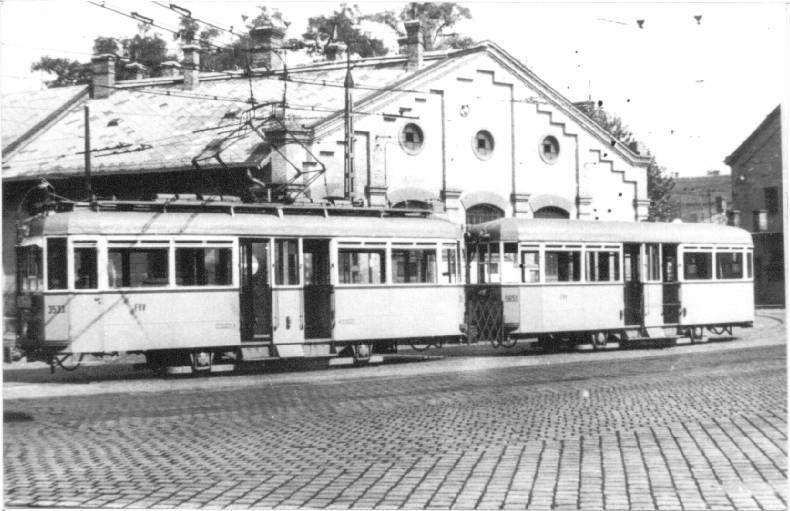 After the successful ezperiments of twin cars by BSzKRt; the companyordered new cars as twin cars. Unusually the Ganz supplied these cars withoutany pneumatic devices; the rheostatic brakes were the only brake system.Since the company didn't have any experience with such cars, for safetyreasons in the first times the magnetic track barke was also coupled inthe brake circuit. 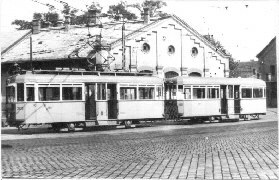 The non-motored cars were braked with solenoid-brakes. 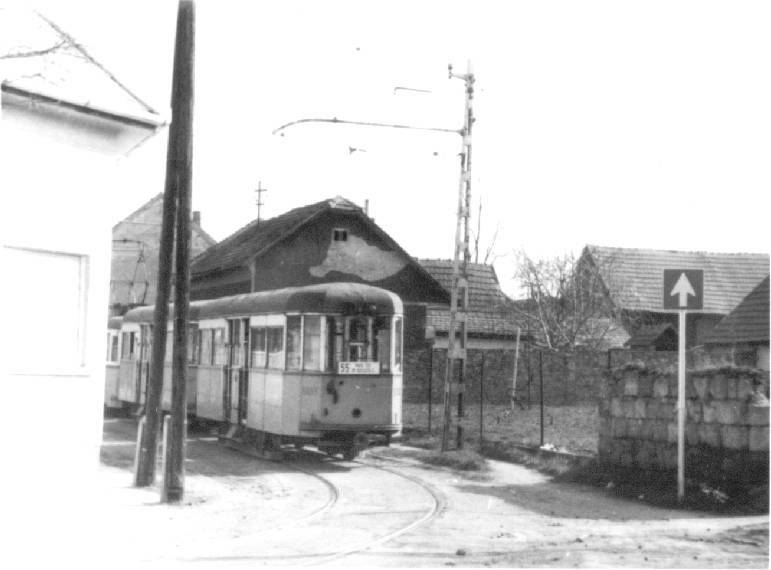 The Budapest-Szentlőrinc Local Electric Railway (BLVV) was duringthis period part of BSzKRt. 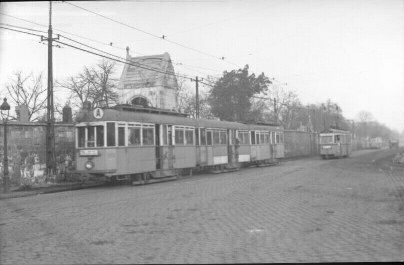 To the suburbs Kispest and Pestszentlőrincwere the busiest lines, that's why here appeared these long trains. 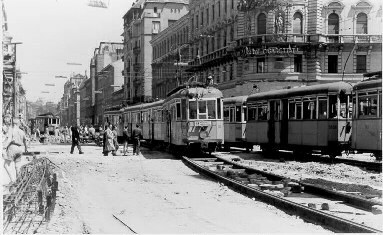 Inthe '30s on Erzsébet híd a twin unit and a three-car multiple-unit. 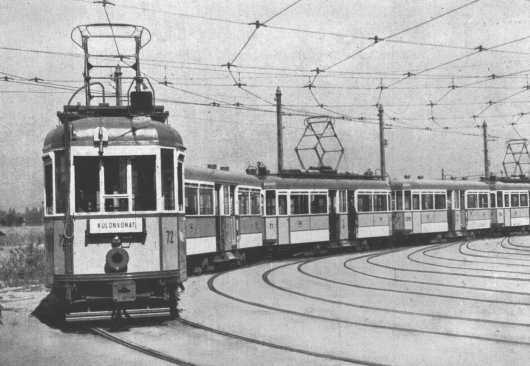 The multiple unit device was first used on BHÉV EMUs. 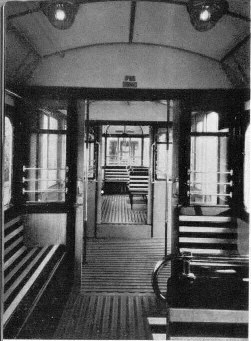 On tramsfirst appeared on these cars. The nowdays working UV three-car trainsetswere also supplied with this type of multiple-unit devices. Aspecial trailer was # 5714; it had three entries in the middle. 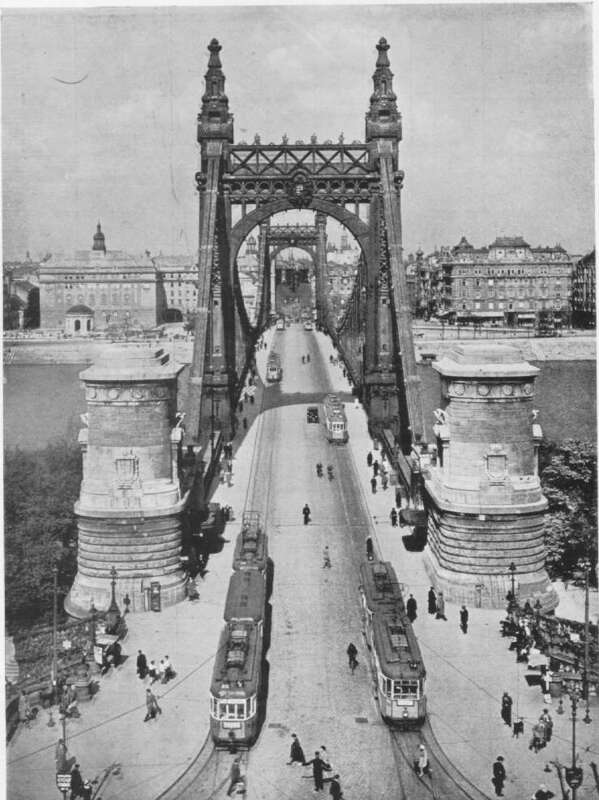 This trailer was destroyed in the World War II. 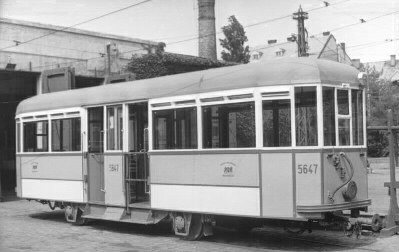 #5647 trailer with Böcker-system brakes in Zugló depot. These trailers were pulled by conventional motrcars. 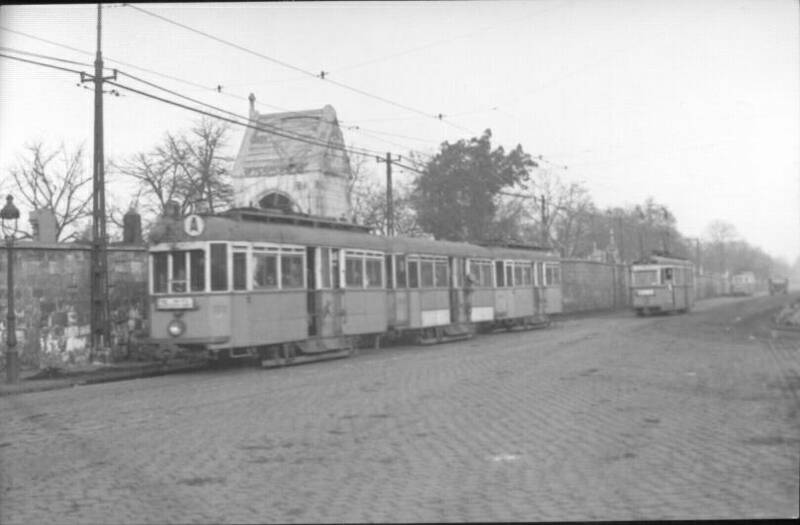 Amultiple unit train on line 28A on Salgótarjáni út (early '50s). Notice the different colour scheme: the motrcars wearing the FVV'sfull yellow liveries, the trailer is still coated with the earlier yellow-whiteliveries. 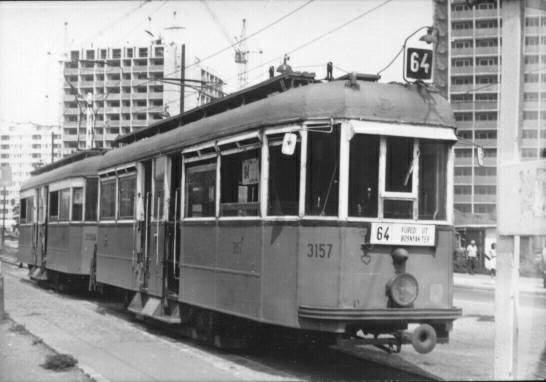 #3538 in a four-car train on line 68 at Blaha Lujza tér in time of buildingthe subway. 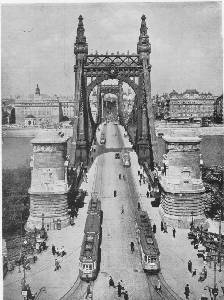 These cars were supplied a peculiar coupling, wich automaticallycoupled the high pressure pipes. These cars had Lambertsen-system as pressurebrakes. 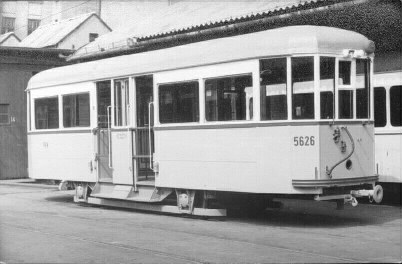 #3533 in front of Baross depot. From the '50s one controller from the motorcars were put intothe trailers, so these multiple unit cars were used either as four-cartrains (M+T+T+M) or in two cars (M+T). 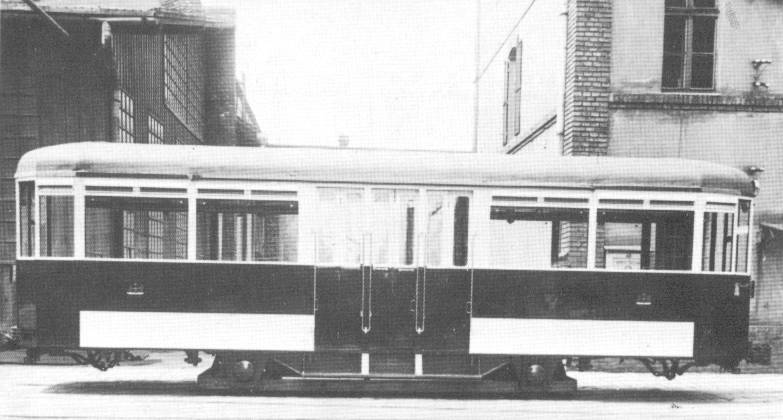 The motorcars were scrapped in themid '60s. #5626 trailer in a workshop ('50s). 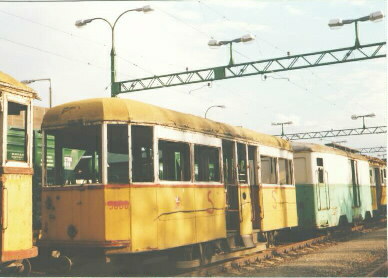 #3157 was one of the last twin cars on line 64, at Vezér út. 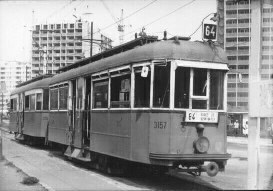 The twin cars were scrapped in early '70s. 5659,5661 at Rákospalota terminus of line 55, in Kismező utca (in mid '70s). 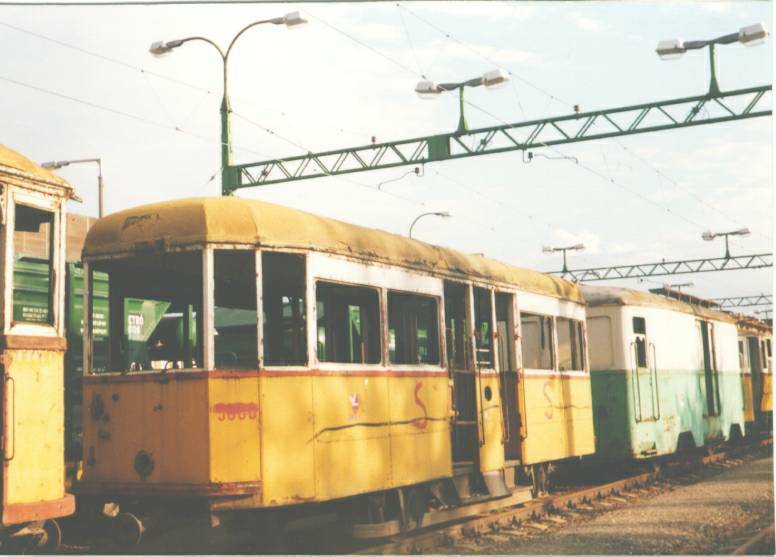 These cars were formally part of multiple unit trains, at thistime they supplied with Böcker brakes, and used in conventional M+T+T units.These trailers were scrapped in late '70s. #5600 trailer in Szentendre HÉV depot. This is the only middle entrance car left, and waiting to itsreconstruction.